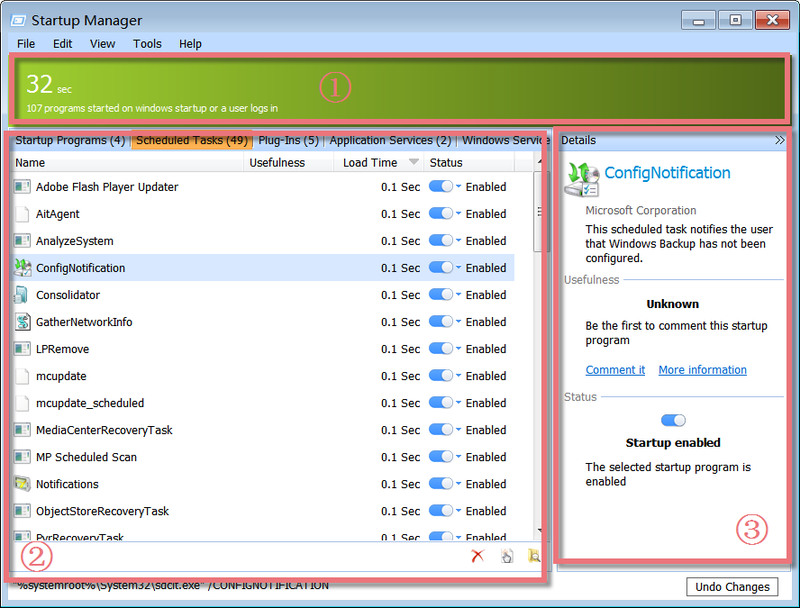 Startup Manager is a powerful yet easy-to-use program that allows you to centrally manage all of these items by delaying some programs auto-startup after booting system, or removing unnecessary programs, as well as making enough resources for system boots, speeding up PC loading to the fastest performance with one single interface. 1. The Above Green Area: shows the windows boot time and how many programs started when windows startup or a user logs in. 2. Left-hand Lower Box: displays a laundry list of programs including windows startup programs, scheduled tasks, plug-Ins and some application services with a few information on the process name, usefulness, load time, status and path. 3. Right-hand Lower Box: shows detailed information on a selected process, such as process name, manufacturer, usefulness and its status on windows boot. You can click the links here to comment the selected process and give recommendations, or click more information to learn the process on our web data base, or even to edit this selected entry. All the programs that starts automatically at the beginning of Windows Startup will be listed out for your reference, including program icon, product name, description and company. If an entry is unnecessary to start with Windows boot, right click and choose "Delay" it, or click "Edit", you can also find "Delay" in the list. Therefore, programs will start in sequence according to the default delay time. The delay interval is set in seconds. The default is 30 seconds and the maximum interval is 270 seconds. 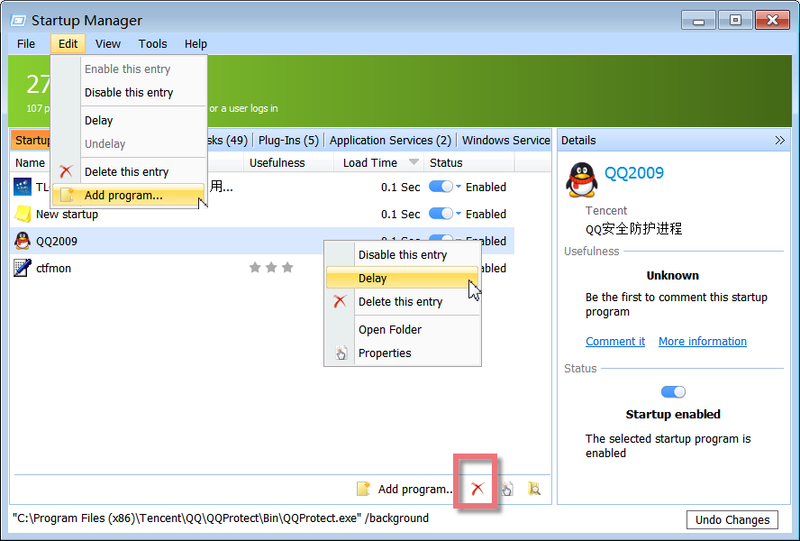 Right click an entry and choose to disable it, and the program will no longer be started the next time you start Windows. Or click "Edit", you can also find "Disable this entry" in the list. In this way, you can find out for certain whether the entry is needed. If something doesn't work properly the next time you start Windows, all you have to do is "Enable this entry". If you are certain that you no longer need an entry, you can entirely remove it by right clicking and choosing "Delete this entry" from the list. 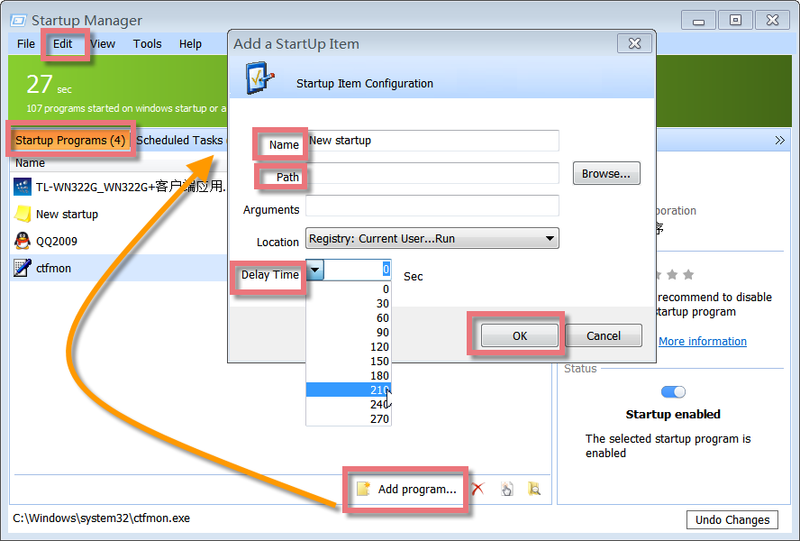 If you wish to add a program to one of the startup folders yourself, click "Add program..." on page of Startup Programs, or click "Edit", you can also find "Add program..." in the list. Enter the name of the desired application in the dialog and enter the directory path of the program file in the Path/Command Line box. You can use the Browse... button to help you find the file. You may also edit any of the existing listed items in order to move them from one location to another, change their program description, or update the command line that is being used to start the item. Here you can also schedule the delay time as you need. You can set it to auto-start 30 seconds later after windows boot. Therefore, programs will start in sequence according to the delay interval preset by you. The delay interval is set in seconds, the default is 30 seconds and the maximum interval is 270 seconds. Or you can enter the time constant by yourself. If you want to undo all changes you made with Startup Manager in recent days, you need to click "Undo Changes" in the bottom right hand corner. A dialog will pop up showing you the programs that you've changed. 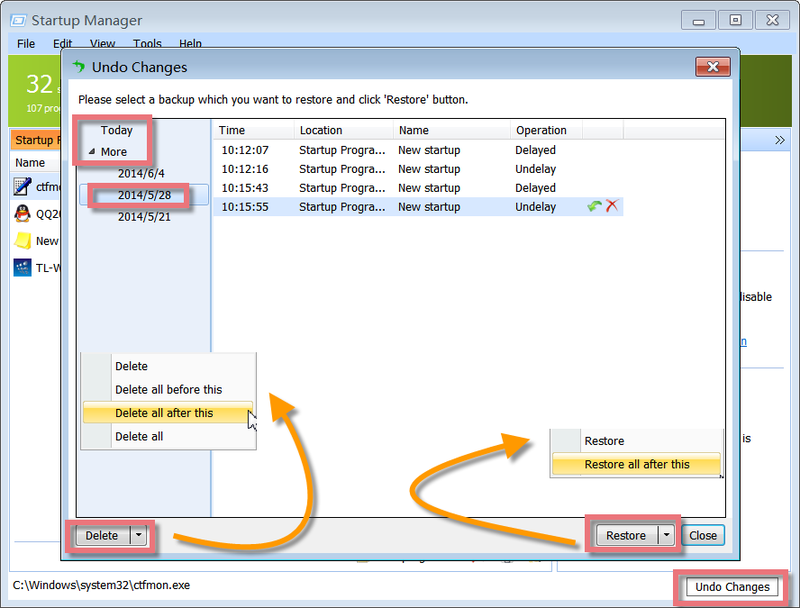 According the days, you can choose to restore or delete these backups that are showed with some information, including operating time, location, program name and operating status. Click "Startup items", Startup Manager will pop up. Click "Startup Manager" button, Startup Manager will pop up. Find and click Startup Manager icon in the Dock bar, Startup Manager will appear. If Startup Manager is not in the Dock bar, click in Dock bar, Startup Manager will show in a new popup window. Please note: if you want to add Startup Manager in the Dock bar, click in Dock bar, remove any icon by dragging it out of the Dock firstly, and then drag Startup Manager in.